According to the US Consumer Product Safety Commission, 27,000 residential fires and 20 deaths were caused by fires that started in fireplaces, chimneys, and chimney connectors in 2007. These are the latest statistics available as of August 2010. CPSC research indicates that most wood heating fires involve the chimney and not the appliance itself. The majority of these fires are contained within the chimney and cause no damage to the house. The Commission is concerned, however, not only about the chimney fires that did ignite other parts of the house, but also about the potential future hazard from the continued use of chimneys whose structural integrity has been compromised by a chimney fire. This is especially true in light of the fact that many contained chimney fires are not reported to the fire services; in fact, consumers may not even be aware that a chimney fire has occurred. Therefore, the Consumer Product Safety Commission is issuing a special safety alert concerning chimneys used with wood burning stoves, fireplaces, and fireplace inserts. The Commission urgently warns consumers to be aware of the potential fire hazards associated with these chimneys. Now that the nation has entered the heating season, the Commission strongly urges you, if you have a stove or fireplace, to check the chimney for any damage that may have occurred in the past heating season. If it is difficult to examine the chimney, a local chimney repairman, chimney "sweep," or dealer can help. Have any damage repaired NOW. Improper chimney installation too close to wood framing. Installation of thermal insulation too close to the chimney. Improperly passing the stovepipe or chimney through a ceiling or wall, causing ignition of wood framing. Structural damage to the chimney caused by the ignition of creosote (a black tar-like substance that builds up inside the chimney in normal use). Corrosion or rusting of the inner liners of metal chimneys. Structural damage also occurs in masonry chimneys, often associated with deterioration or improper installation of the chimney. The tile inner liner and the surrounding brick or block structure may crack and separate, perhaps as a result of the ignition of creosote that has built up in the chimney. Many old chimneys do not have a tile liner. If your chimney does not have a liner, the addition of a properly installed liner is advisable. Also, a clay liner should be sealed with refractory cement. Even when the heating appliance is properly installed, people with either metal or masonry chimney systems should frequently check the chimney for creosote deposits, soot build-up, or physical damage. This involves only a simple visual examination, but it should be done as often as twice a month during heavy use. If you see heavy creosote buildup, suspect a problem, or have had a chimney fire, a qualified chimney repairman or chimney "sweep" should perform a complete safety inspection. They can arrange for any necessary repairs or creosote removal, which must be done before the heating appliance is used again. There are products now available which, according to recent tests conducted by independent laboratories, show promise for reducing the production of creosote and harmful pollutant emissions. 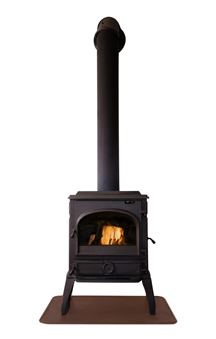 Advance wood stove designs appear to provide more complete combustion of the fuel. Catalytic combustors appear to achieve similar results, and are available with new stoves or as separate components which can be installed between the flue gas exit and the chimney connector of existing stoves. Be sure that the chimney and stovepipe were installed correctly in accordance with the manufacturer's recommendations and local codes. If there is any doubt, a building inspector or fire official can determine whether the system is properly installed. Minimize creosote formation by using proper stove size and avoiding using low damper settings for extended periods of time. Have the chimney checked and cleaned routinely by a chimney "sweep" at least once a year. Inspect it frequently, as often as twice a month if necessary, and clean when a creosote buildup is noted. Always operate your appliance within the manufacturer's recommended temperature limits. Too low a temperature increases creosote buildup, and too high a temperature may eventually cause damage to the chimney and result in a fire. Frequently look for signs of structural failure. If you have had a fire or other safety problem with your chimney, or would like additional information, call the Commission's toll-free Hotline 800-638-CPSC. The U.S. Consumer Product Safety Commission protects the public from the unreasonable risk of injury or death from 15,000 types of consumer products under the agency's jurisdiction. To report a dangerous product or a product-related injury, you can go to CPSC's forms page and use the first on-line form on that page. Or, you can call CPSC's hotline at (800) 638-2772 or CPSC's teletypewriter at (800) 638-8270, or send the information to info@cpsc.gov. Consumers can obtain this publication and additional publication information from the Publications section of CPSC's web site or by sending your publication request to publications@cpsc.gov. If you would like to receive CPSC's recall notices, subscribing to the email list will send all press releases to you the day they are issued.